We must thank Katie and Mike Skibbe for all the work they and their crew did to make this a fabulous event. 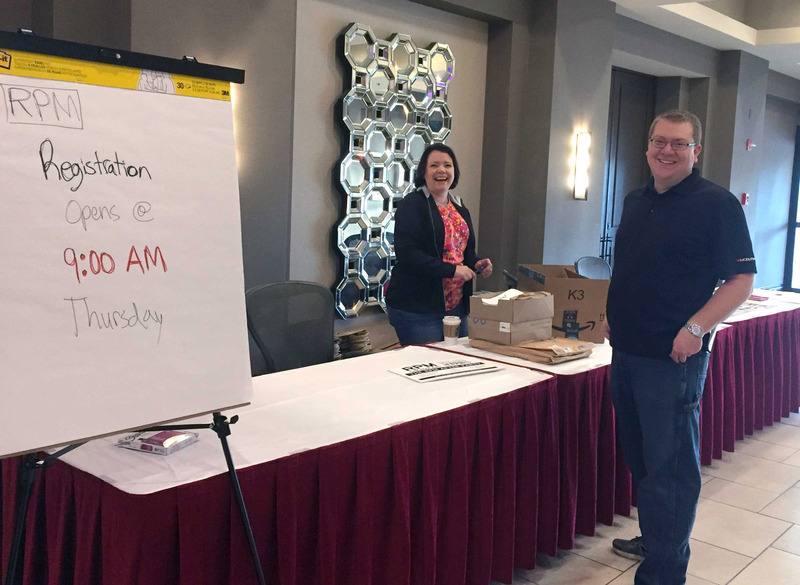 I caught them smiling on Thursday morning, just before the registration table opened. 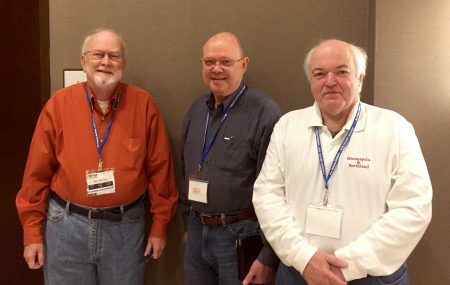 From left to right, here are Bill Welch, Nelson Moyer, and Lester Breuer at the RPM. In addition to many fine presentations, the RPM is a great place to met people and network. 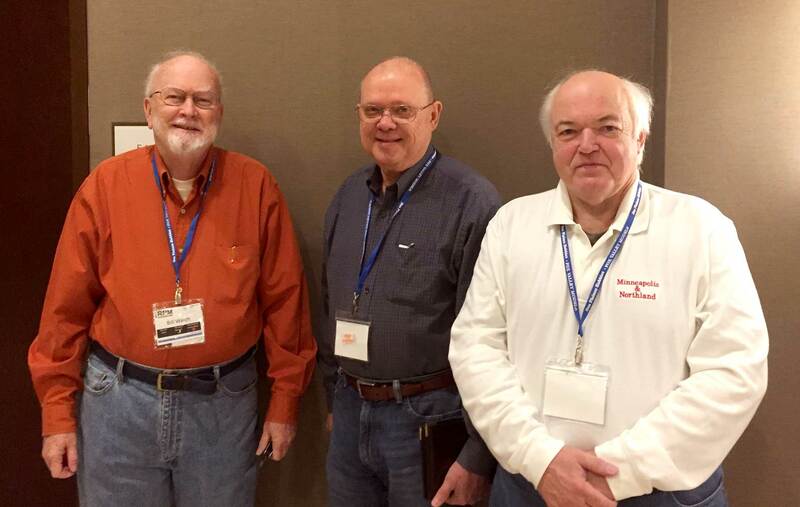 I was able to corral a few of our blog contributors for a quick photo. I also met Pete Hall and George Toman but missed snapping a photo. 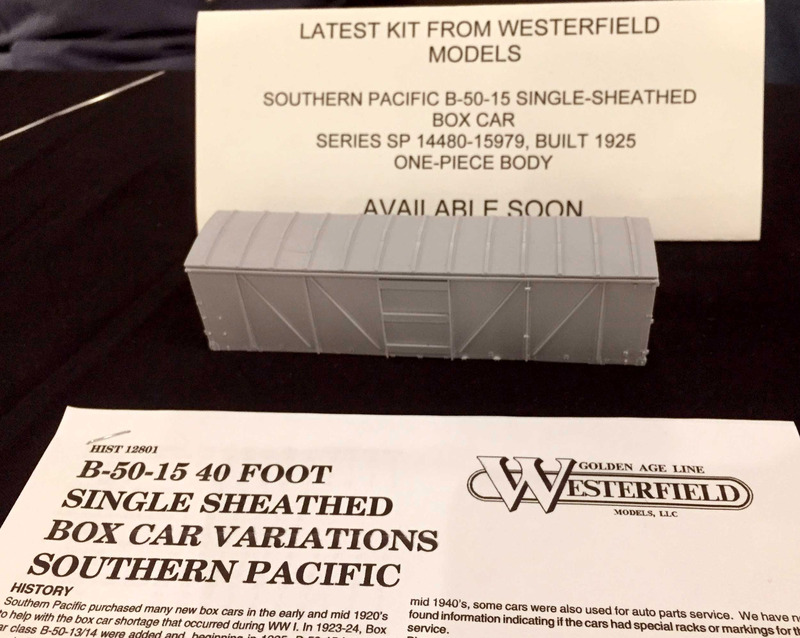 When Frank Hodina arrived with Resin Car Works kits to sell, there was a swarm of activity like bees about a hive as the new HO scale UTLX Class X 6500-gallon tank car kits sold out quickly. After the smoke cleared, I noticed a nice crisp casting displayed on the table. 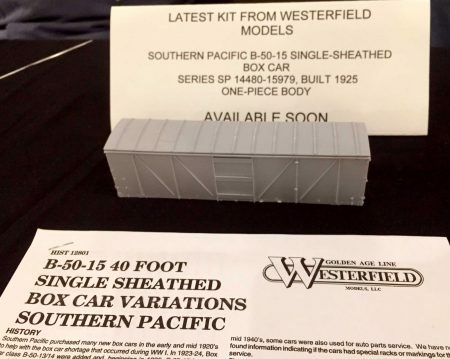 This is a new, HO scale Westerfield Models Southern Pacific B-50-15 box car kit coming soon. Frank is casting up parts for addtional UTLX 6500-gallon Class X tank car kits. A new master is underway for the 10,000-gallon kit, too. These will be available through the Resin Car Works website soon. Additionally, the kit instructions and extra photos will be posted shortly. We will post notices on the instructions and kits here on the blog. I took a number of photos but neglected to take any of my own display! 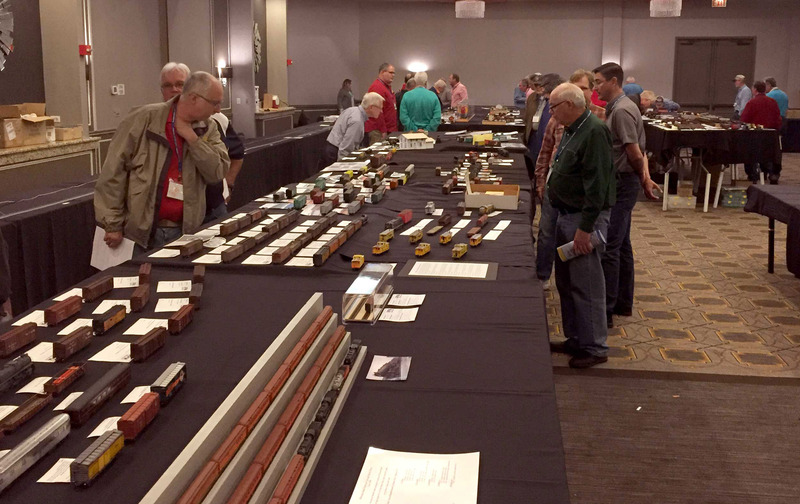 Jeremy Dummler has posted quite a few event images. Here are the links to these galleries. It was a long nine hour drive back to my metro-Nashville home but it gave me time to think about the RPM. I feel recharged and ready to tackle a few hobby projects that have been dormant since a recent move. My mind is abuzz with tips, techniques, and resource suggestions. There are a few blog posts on the way, too! Thanks so much for sharing the photos, it looks like it was a great show. I have not had any bluejeans in about three decades and when Kohl’s had a sale on Levi’s recently I decided to buy a pair for my trip to Lisle, knowing I could not wear the uniform I wear here in Clearwater, FL about 355 days a year, T-shirt and shorts. About midway through Saturday I realized the backs of both hands seemed irritated and into the afternoon I noticed it really bothered me when I put my hands in my pocket. Sunday and on into Monday my hands burned when I washed them. The thread used to seam the pockets had abraded my hands. I sent an email to Levi-Strauss and they want me to send the jeans to them—their cost—and they will replace the jeans plus give me two more pairs. Such is the price of being a Prototype Modeler. Great presentation as well, Eric! Thank you, Matt! – Eric H.
Looks like a great meet; sorry I had to miss. My body screamed out in pain and said, “You’re not going!” Hopefully I will make it in 2018. You were missed, Jared. Now we expect more models displayed next year! – Eric H.